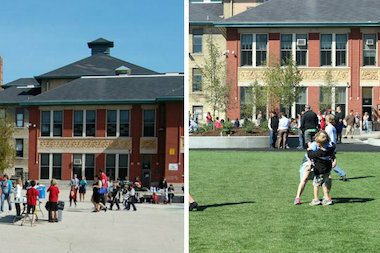 Ravenswood Elementary's outdoor space has been transformed from an asphalt lot to a green oasis. RAVENSWOOD — What a difference a year makes. "Last year at this time we were standing on an asphalt lot," said Nate Manaen, principal of Ravenswood Elementary, 4332 N. Paulina St.
On Sunday, Manaen welcomed students, parents, community members and elected officials to the grand opening of the school's new $1.5 million outdoor campus, complete with turf field, a mini-amphitheater and creative play equipment. "This is what it looks like when education is done right. It's a fitting reflection of the amazing, wonderful things happening inside our classrooms every day," said Manaen. The campus is also intended as a neighborhood hub, he added. "This is your space. Enjoy, play, have fun," he said. Mayor Rahm Emanuel, who committed $350,000 in city funds toward the project, was on hand for the ribbon-cutting ceremony. "This is a testament to when a community bands together," said Emanuel. "You've been asking for this ... you didn't just wait," he said. "You organized, you got it going." Adam Walsh was among those who spearheaded the school's fundraising efforts. A retiree with no ties to the school other than being a neighbor, Walsh went to the 47th Ward office looking for volunteer opportunities and made Ravenswood School and its playground dream his mission. "You meet the most wonderful people, the most driven people," said Walsh. A chance connection with the principal at Goethe Elementary led Walsh and the group at Ravenswood to apply for an Illinois Environmental Protection Agency green infrastructure grant, which Goethe had previously won. "They gave us their grant," Walsh said of the folks at Goethe. "They did the heavy lifting." In 2013, Ravenswood was announced as one of 13 recipients of the grant, nabbing $750,000 toward construction of the outdoor campus. The long-gestating project — in the works since 2009 — "took off like a rocket" with the addition of the state monies, according to Mike Waechter, a Ravenswood parent who also served as the architect of the outdoor campus. Now Ravenswood students and members of the surrounding neighborhood not only have a green space for play, but a "green" space that diverts 1.5-million gallons of storm water from the city's streets and sewers. "Every surface here is permeable," said Waechter. Rather than collecting on asphalt and running into the streets like it used to, rain water will be stored in a reservoir underneath the playground and gradually seep into the "aquifer as nature intended," he said. "If we don't put a million gallons into the sewers and another school doesn't put a million gallons and another doesn't, it adds up pretty quickly," Waecther said. For the scores of children scampering across the playground Sunday, storm water management was hardly top of mind as they kicked soccer balls around the new turf field, moved super-sized chess pieces across a giant checkerboard and clambered up and down a serious of rubberized mounds. "When you come out and the kids are playing, that's the payoff," said Walsh.